Thirty years ago, photographers Robert Adams and Len Jenshel turned their cameras from the magnificent landscape before them to the view that lay behind them. Their images of the changing land the roadways, tract housing, trailer parks, and shopping malls compelled many photographers to focus attention on the dramatic impact of our interaction with and alteration of the land. The photographers in this exhibitionMark Klett, Robert Dawson, Peter Goin, John Pfahl, and Martin Stupichare but a handful of the photographers working intently through the last quarter century to create stunning and compelling images that underscore our relationship to the landscape. For nearly twenty years, Mark Klett has lived in and photographed the American Southwest. His images collectively portray an intimacy of place and experience, of culture and history. Human presence is to be found in every one of his images in acknowledgement of his belief that humanity is part of nature, not distinct from it. Working with a large format view camera similar to those of his 19th century predecessors, his search is not for new and unexplored territory but takes place within the now occupied terrain of expanding subdivisions, streetlights and cars, highways and jet contrails, footprints and bullet-riddled cactus. His interest is not only what the landscape looks like but also why it looks as it does. Beneath the Great Arch, near Monticello, Utah, 6/21/82 is typical of Klett's image-making and printing process. Trained as a geologist, he often interjects a familiar object, or in this case a friend, to offer a sense of comparable scale. He works with positive / negative Polaroid film that simultaneously gives him a contact print from which he can evaluate the image and a fine-grain, black and white negative. When enlarging, Klett retains all of the aberrant details of the Polaroid process as an acknowledgement of the materials of his craft. Using silver ink, he inscribes such details as location and date in a manner reminiscent of the inscriptions made by landscape photographers on their prints a century ago. Klett's intimate knowledge and understanding of such notable 19th century photographers as William Henry Jackson and Timothy O'Sullivan was acquired through his experience as Chief Photographer for the Rephotographic Survey Project. From 1977 to 1979, Klett and three other photographersJoAnn Verburg, Gordon Bushaw and Rick Dingusused copies of original images made a century earlier by W. H. Jackson, Timothy O'Sullivan, John Hillers, A. J. Russell, and Alexander Gardner to find the exact location and vantage points from which to re-make their photographs. Carried out with scientific methodology, over 120 images were repeated. The project culminated in the publication Second View: The Rephotographic Survey Project. For more than twenty years, Robert Dawson has photographed the changing conditions of the western landscape and its environment. With awe and angst, respect and resolve, his quest raises cultural and societal questions about our actions, achievements, and failures real and perceived and our attitude toward the land. His investigations have taken the form of projects, collaborations with other photographers, writers, and advisors of various disciplines who have collectively shared the need to explore the impact of human growth and the implications for the future. Two Scientists Discussing the Demise and Restoration of California Salmon is from Dawson's most recent project, Farewell, Promised Land. Inspired by Raymond Frederick Dasmann's The Destruction of California (1965), a classic book that became a fundamental resource in the conservation movement, Dawson and co-collaborator / writer Gray Brechin set forth to explore California's environmental and social condition thirty years hence. The result is a 150-year history of the destruction of California's environment and the decimation of its native peoples, plant life, and wildlife, all due to economic development. While history discloses what is lost, the rate of change in the present urgently needs to be exposed if California's fate is to avoid totally-realized piecemeal urbanization. Love of place and a collective memory of its past have united individuals in organizing efforts to alter the course of California's demise. Dawson's first project, The Mono Lake Series, was a three-year photographic record (1979 1982) of the unnatural death of the endangered Mono Lake, which was being drained of water for urban use. The Great Central Valley Project (1982 1986) with collaborator Steve Johnson explored the modern reshaping of California's agricultural heartland, a major source of California's economy. The Water in the West Project, begun in 1983 and co-directed by Ellen Manchester, is an ongoing project that focuses on our most fundamental resource water. Precipitated by a growing water crisis in the developing West, water use and management issues today form the basis of many of our environmental and cultural ideologies. Other photographers involved in this project include Peter Goin, Mark Klett, Terry Evans, Laurie Brown, Martin Stupich, Gregory Conniff, and Wanda Hammerbeck. The Pyramid Lake Project, begun in 1989, is a collaboration with Peter Goin that explores the Truckee River and the battle for its use between the city of Reno, Nevada; the farmers of western Nevada; and the Paiute Indians of Pyramid Lake, Nevada. Peter Goin's seminal publication, Human nature, considers America's transfigured landscape and its cultural implications. Through images of the managed forest, the reconstructed shoreline, the controlled rivers, the endangered wildlife, and the incursions of mining and reclamation (as seen in A tailings plateau near Miami, Arizona), Goin's photographs underscore and propel the new merging of controlled nature and its cultural manifestations into thoughtful deliberation. Faux environments zoos, casinos, theme parks, and golf coursesmay be the extremes of our new terrain but everywhere across the country, the work to create the illusion of nature is rapidly escalating as biogenetics and other new technologies perfect our efforts. Goin's images poignantly convey the sometimes seamless, sometimes indifferent alterations in the landscape and raise fundamental questions and perceptions about our understanding of nature and ourselves. The wilderness that once served as the source of our cultural, economic, and spiritual fulfillment today is less a physical reality than a cultural idea, revealing more about human culture than the interconnectedness of life. The Clifton-Morena Pit (Top Image) is one of the largest open-pit copper mines in North America. Clifton is part of a deep, isolated canyon system in southeastern Arizona carved by the San Francisco River and its tributary, Chase Creek. Chase Creek was channelized with slag after 1906 to control floods, making the area easier to develop. Much of John Pfahl's photographic explorations over the last 25 years have been driven by an interest in recontextualizing the Nineteenth Century ideals of the sublime, the beautiful, and the picturesque in the present-day. His series Power Places (1981 1984) explored hydroelectric and nuclear power plants in situ and bathed in early morning or dusk light reminiscent of the Hudson River School palette. The series was pivotal and controversial, bringing criticism and acclaim from both proponents and antagonists of the nuclear power debate of the time. It was his introduction to a series of photographs by William Henry Jackson and Japanese woodblock prints that directed his attention to a subject that had fascinated him ever since his childhood waterfalls. Nineteenth Century guidebooks described waterfalls throughout New England for their energy potential and not for their implicit beauty. In his search to locate and photograph these sites, Pfahl discovered that his interest again was drawn to those sites where nature and industry seem to co-exist. Green Mountain Power Corporation, Winooski River, Vermont, June 1989, is an extraordinary example. Created in an elongated, panoramic format and using the humid and overcast skies of the Northeast to full advantage, the tension of this work hangs in the balance of the artifice of an imposed dam creating the falling water the Nineteenth Century notation realized and the delicate power building rising from the white mist of rushing water below. In 1997, after relocating from Boston, Martin Stupich began photographing the austere and expansive landscape of Carbon County, Wyoming from the air. It is his first series to use the aerial vantage point as a method of considering our connectedness with the land. His many years as a documentary photographer for engineers and architects for whom he has recorded the industrial landscape bridges, dams, launch pads, mines and buildings in sit in forms his photographs with a sensibility and attention to our presence in Wyoming's unique geology. For those who have traveled the Shirley Basin route to Casper, the view of Snow Fences, Highway and Dry Gravel Pit, Carbon County, WY is readily recognizable as the Wyoming 77 cutoff north of Medicine Bow. The interplay of lines and surface breached only by nearly square depression offers the nuances of geological structures and the engineered constructions of roadways and snow fences, bathed in light, defined by shadow, and poised in time and space. The common element of Stupich's commercial and personal work is water the precious lack of it in the West and our great efforts to control it. In 1989, he joined the Water in the West project with other photographers who shared these interests and concerns. Unlike many of them, his images revealed a symbiotic marriage of land and water management interventions. Left: Peter Goin (American, b. 1951), The Clifton-Morena Pit, 1993, Type C chromogenic development prints (2), 16 x 20 inches each, W. Sherman and Dorothy A. Burns Revocable Trust, University of Wyoming Art Museum Collection, 2001.3. Center: Mark Klett (American, b. 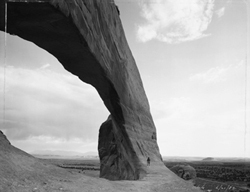 1952), Beneath the Great Arch, Near Monticello, Utah, 6/21/82, 1982, Gelatin silver print, 16 x 20 inches, University of Wyoming Art Museum Collection, 2001.1.1. Right: John Pfahl (American, b. 1939), Green Mountain Power Corporation, Winooski River, Vermont, June 1989, 1989, Ektacolor print, 24 x 30 inches, W. Sherman and Dorothy A. Burns Revocable Trust, University of Wyoming Art Museum Collection, 2001.2.